The government is to end an arrangement that allows other countries to fish in UK waters, it has been announced. The convention allows Irish, Dutch, French, German and Belgian vessels to fish within six and 12 nautical miles of UK coastline. Environment Secretary Michael Gove said the move would help take back control of fishing access to UK waters. The European Commission said it "took note" but felt the convention had been superseded by EU law. Ireland's minister for agriculture, food and the marine, Michael Creed, however, said it was "unwelcome and unhelpful". "Brexit poses very serious challenges to the seafood sector and this announcement will form part of the negotiations," he said. The Scottish government backed the idea, saying it had been pressing for it "for some time". The London Fisheries Convention sits alongside the EU Common Fisheries Policy, which allows all European Union countries access between 12 and 200 nautical miles of the UK and sets quotas for how much fish nations can catch. The relationship between the UK and Ireland is further governed by a separate arrangement. Withdrawing from the convention, which was signed in 1964 before the UK joined what became the EU, means UK vessels will also lose the right to fish in waters six to 12 nautical miles offshore of the other countries. What happens to the 12 to 200 mile area will be one of the issues at stake in Brexit negotiations. Michael Gove told the BBC's Andrew Marr the change was about "taking back control" of UK waters, 6-12 miles from the coast. When the UK left the EU it would become an "independent coastal state", he said. He said the EU's common fisheries policy had been an environmental disaster and the government wanted to change that, upon Brexit, to ensure sustainable fish stocks in future. But the SNP's Richard Lochhead, who held the post of fisheries minister in Scotland until last year, has concerns around fishing being used as a "bargaining chip" by the government, which would "let down UK fishermen". "Michael Gove is doing his best to get maximum publicity out of the easy bit," he told BBC Radio 4's The World This Weekend. "But the difficult, complex bit is still to come [with] the Common Fisheries Policy. UKIP's fisheries spokesman Mike Hookem also said he feared another "wholesale betrayal" without assurances about the 200-mile zone. "Fishing communities across Britain voted to leave the EU to get back the rights to earn a living, support their communities and to stop the EU plundering our seas of fish that the UK could exploit economically," he said. He added that the announcement was "no victory for the fishing community" and was instead a "government attempt to use smoke and mirrors to placate British fishermen, while at the same time having the option of handing most our fishing rights to the EU". Government figures say fishing contributed £604m to UK GDP in 2015 and employed around 12,000 fishers. In 2016, the fish processing industry supported around 18,000 jobs. 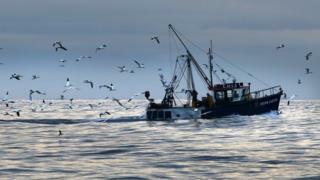 The industry's body, the National Federation of Fishermen's Organisations, welcomed the decision. Chief executive Barrie Deas said: "This is welcome news and an important part of establishing the UK as an independent coastal state with sovereignty over its own exclusive economic zone." Its chairman Mike Cohen said a 12-mile exclusive zone for UK boats would be "a good thing" for the UK's inshore fishing fleet. Will McCallum, Greenpeace UK head of oceans, said leaving the convention would not in itself deliver a better future for the UK fishing industry, and that for years governments had blamed the EU for their "failure" to support the small-scale, sustainable fishers. He said, for example, that the UK had had the power since 2013 to decide how to allocate its EU fishing quota but that a report by Greenpeace in 2016 had found almost two thirds of that quota was concentrated in the hands of three companies. He said the UK would also still be bound by the UN convention of the law of the seas - which requires cooperation with neighbours. But Mr McCallum said he was "excited" that the government was making fishing a priority, after fearing fishing communities would end up "at the bottom of the heap" amidst complex Brexit negotiations. "As a country outside the EU we need to consider how we can best co-operate with our neighbours, rather than unilaterally withdrawing from all agreements in the hope that standing alone will make us better." Reality Check: How would Brexit affect the UK's fishing waters?